Really. One of the weirdest animals ever to live had five fully functioning eyes and a long flexible hose-like proboscis or snout with grabbers on the end. 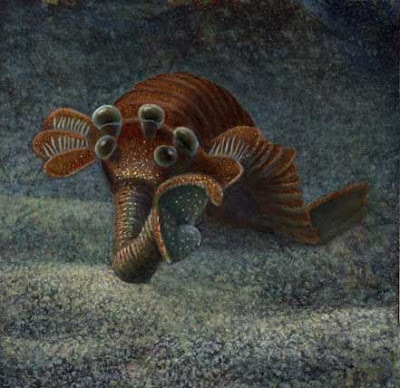 Opabinia is a highly unusual extinct animal found in early Cambrian fossil deposits of Burgess Shale in British Columbia and the Maotianshan shales in Yunnan, China. This weird beastie probably lived on top of the soft sediment on the seabed, and swam after prey using its unusual side flaps. Its proboscis could have plunged into burrows after worms and could also have been used to stir up sea floor sediment in search of food.